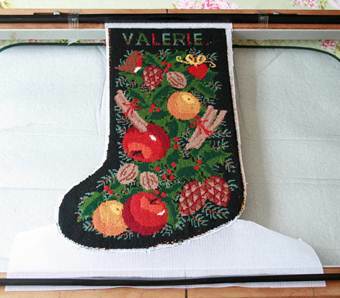 The Christmas Stocking mentioned in my last blog arrived at the beginning of this month. It had been badly made up with piping by someone who must have had little or no experience of the job. I wanted a straight edge with enough extra canvas to attach to my stretching frame that would not come unravelled under tension. So I hand-stitched a piece of spare canvas to the back of the stocking round the bottom edge. This gave me a top and bottom that could be made parallel with each other and square with the sides. That was my theory, but I still didn’t know if it would work. … Now on the frame. Next I covered it with a piece of linen sheeting and gently held a steam iron to it to dampen it; turned it over to do the other side; turned it back again – more steam; checked that the top was still parallel to the bottom; and left it for about three days to become completely dry. 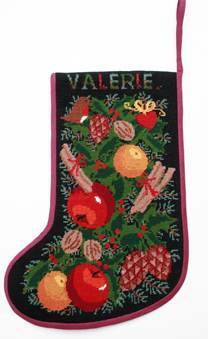 Then off it went to Vi, my Cushion (Christmas Stocking, Doorstop, Anything) Lady to be made up. And here it is – none the worse for its adventures! I am pleased to say, my customer was delighted – as was I. And on top of that, I learnt a new technique which may or may not be the conventional way to do it, but the important thing is, it worked. I find I rather enjoy rescuing.